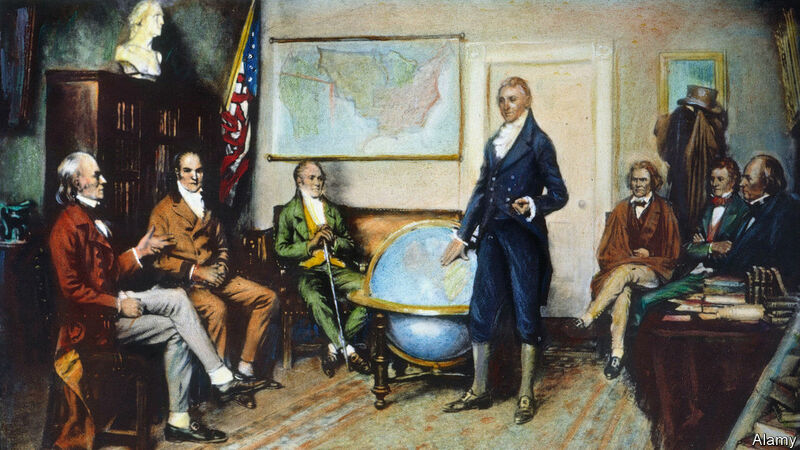 What is the Monroe Doctrine? LAST MONTH Juan Guaidó, the leader of Venezuela’s national assembly, proclaimed himself the country’s acting president. He has been recognised as such by the governments of the United States, and most of western Europe and Latin America. The incumbent president, Nicolás Maduro, whose second term started in early January after a fraudulent election last year, has described the upheaval as a US-backed coup. On the day of Mr Guaidó’s declaration, Mr Maduro cautioned his supporters not to “trust the gringos”. “They don’t have friends or loyalties,” he said. “They only have interests, guts and the ambition to take Venezuela’s oil, gas and gold.” His warning echoes earlier Latin American responses to America’s history of regional intervention. Such interventions were often justified with reference to the Monroe Doctrine, a declaration made by President James Monroe in 1823. What does it say? By 1823 many Latin American countries had gained independence from Spain or Portugal. The Russian tsar had also recently claimed sovereignty over an area stretching roughly from modern-day Alaska to Oregon, and barred foreign shipping there. Britain, which had extensive trade networks in Latin America and wanted to keep its European competitors at bay, proposed a joint announcement with America that would warn against further European intervention. President Monroe, influenced by his secretary of state, John Quincy Adams, opted to make a unilateral declaration to Congress in 1823. He said that the New and Old Worlds were to be two separate spheres. He promised that America would not intervene in European affairs, and that any European attempt to colonise a nation in the western hemisphere would be viewed as an act of aggression against America. It was the starkest expression of American hegemony in the region to that point, and indicated a pivot away from Europe. For years the Monroe Doctrine was more optimistic than realistic. America lacked the naval might to enforce it. It did nothing as Britain took the Falkland Islands in 1833 or when Britain and France imposed a naval blockade on Argentina in 1845. But as America got stronger it started to flex its muscles. It helped kick out Mexico’s French puppet emperor in 1867, and in 1904 President Theodore Roosevelt expanded the remit of the doctrine with a corollary stating that America could exercise “international police power” in the hemisphere. By the 1930s America had annexed Puerto Rico, occupied Cuba and encouraged a rebellion in Panama after that country’s Colombian rulers rejected a proposal for an inter-oceanic canal. During the cold war, the Monroe Doctrine was used as a broader justification for protecting America’s national interests in its “backyard”. In 1962 President John F. Kennedy referred to the doctrine to justify the trade embargo against Cuba. On similar grounds, America has backed 18 attempts at regime change in Latin America since 1945, ten of which succeeded, and provided arms and technical assistance to military groups in the civil wars of Guatemala, Honduras, El Salvador and Nicaragua. The Monroe Doctrine was originally intended as an expression of resistance against European colonialism, rather than an excuse for American intervention in Latin America. But numerous such interventions have made Latin America suspicious of its northern neighbour. Venezuela’s socialist leaders, Hugo Chávez and now Mr Maduro, derived much of their political appeal from their resistance to American “imperialism”. It may have been rash for President Donald Trump to reiterate, after Mr Guaidó’s announcement, that “all options are on the table” as America considers its response to Mr Maduro’s resistance. Such a phrase is taken to refer to the possibility of military action. Though the importance of the Monroe Doctrine has faded since the end of the cold war, some American conservatives still express admiration for it. Rex Tillerson, Mr Trump’s first secretary of state, said the doctrine was “as relevant today as the day it was written”. That sentiment may not have brought much comfort to Latin American listeners. NextDoes screen time affect children?